Dunbar Golf Club (EH42 1LL) is located at the east end of 'Scotland's Golf Coast' in East Lothian, home to some of Scotland's finest golf courses including Open Championship venue, Muirfield. 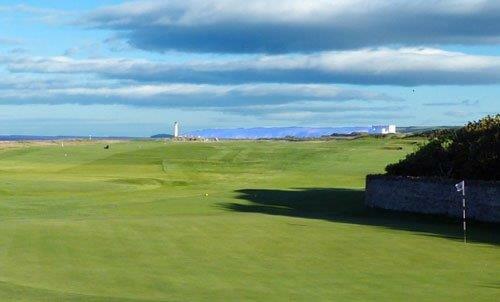 The course at Dunbar runs along a narrow strip of true links land which hugs the North Sea coastline, presenting stunning views and an enjoyable challenge. Dunbar Golf Club is situated just to the east of the town centre. Easily accessible by road, rail and air, the town of Dunbar itself makes for a grand day out, or can serve as the perfect location to base a longer golfing holiday. Please see the map and details on how to find us below. More information on the local area and accommodation can be found here. Head out of Edinburgh on the A1 heading East. Follow Spott Road for approx 1 mile, going past the Belhaven Brewery. Follow the road under the railway bridge and take a right turn at the junction. Take your first left after 400 yards, turning down the hill. The entrance road to Dunbar Golf Club is on your right, just before you drive into the North Sea! Take your first left after 400 yards, turning down the hill. The entrance road to Dunbar Golf Club is on your right, just before you drive into the sea! Head out on the east side of North Berwick on the A198 'Scotland's Golf Coast Road', passing the Tesco supermarket / petrol station. You will drive past the spectacular Bass Rock and Tantallon Castle. The golf club can be reached from Edinburgh and locally by two bus services which stop on the high street in the town centre (0.5 miles from the Golf Club). First Group Travel operate a service from Edinburgh - Dunbar (X6 / 106 ), click here to access the timetable. Perryman's Buses operate a service from Edinburgh - Berwick-upon-Tweed which stops in Dunbar town centre, click here to access the timetable. Dunbar has a train station which is a stopping point on the east coast mainline (Aberdeen - Edinburgh - London). This is operated by Virgin East Coast and Scotrail. After 0.4 miles, take a left, turning down the hill. The entrance road to Dunbar Golf Club is on your right, just before you walk into the sea! Edinburgh airport is the nearest airport to Dunbar. Located on the west side of the Edinburgh and taking approximately 45-50 minutes to reach Dunbar by car / taxi (outside rush hour), please follow the directions 'from North and West' detailed above. Alternatively, the new tram system or bus service from the airport will take you directly to Edinburgh Waverley train station where you can easily change for a train to Dunbar. Newcastle and Glasgow airports are appoximately 2 hours from Dunbar.